Ah, the Red vs. Green rivalry can get a little intense around here. Rowdy's thoughts?...Man, my "G" is sure pulling strong today!! 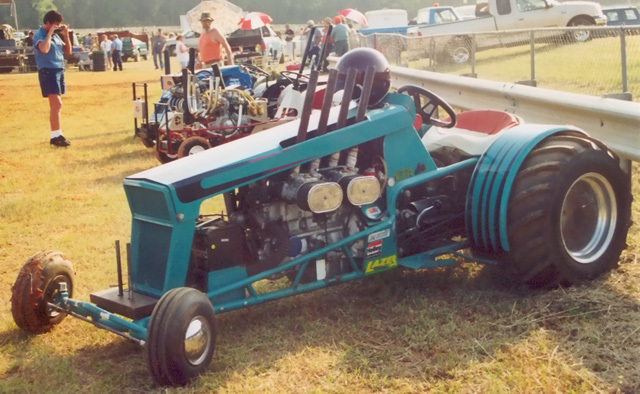 Speedy finished his 1936 F-30 in October 2001 and pulled it at the Asheville, Saluda & Sunny Plain pulls. (See coverage below). 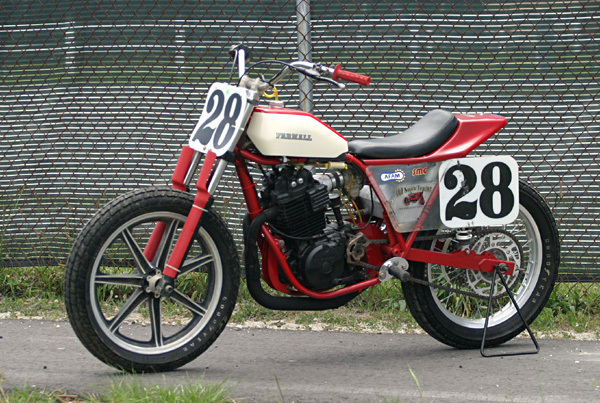 We love those spoke wheels! He really enjoys working on the older tractors. The sled's humble beginnings as a trailer frame. 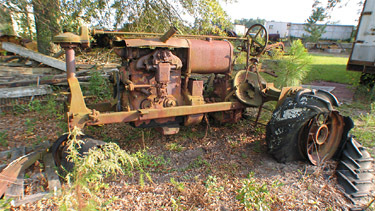 We somehow found the time, as the sled project was nearing completion, to haul 5 tractors plus the Cub Cadet (with the people hauler, of course) to the pulls near Asheville, NC and Saluda, SC over the two weekends prior to the Sunny Plain event. 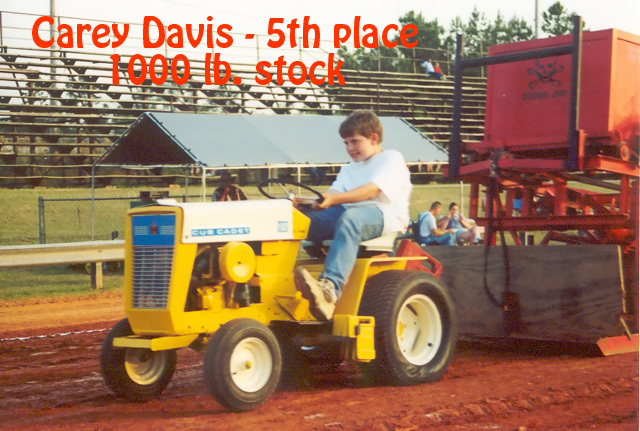 Carey won 5th place in his class with the Cub Cadet at Asheville, the best showing of our group. Speedy pulled his newly completed F-30 at both pulls, but it was obvious it needed a little more tuning. Laura enjoyed pulling with Speedy's 560 for the first time at Asheville. That Saturday the wind chill was in the teens pretty much the whole day, and the glove and stocking hat vendors made out like bandits. Troy took a 2nd at Saluda. We were all tired that weekend, but at least the weather was balmy when compared to Asheville. Speedy ran into Frank Suchy in Saluda, who offered to finish tuning the F-30 since Speedy was so busy with building the sled. 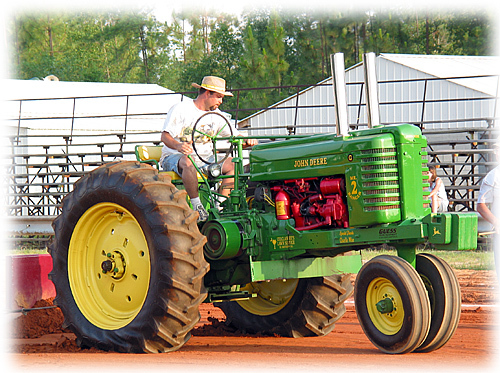 Thanks, Mr. Frank, for the F-30 won the 5500# class in the Sunday pull at Sunny Plain! 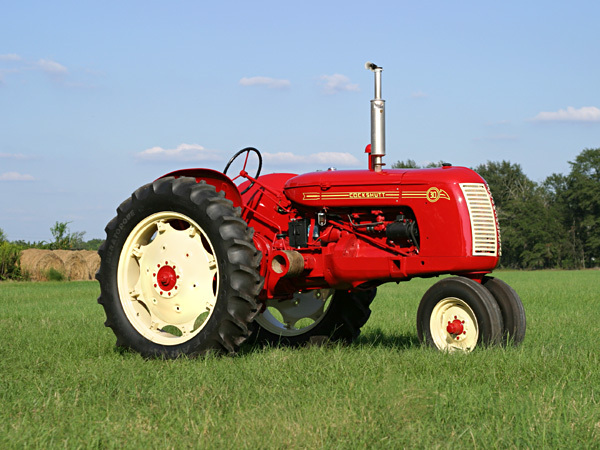 As a matter of fact, the rest of us had a great day that Sunday at Sunny Plain: Keith won the 7500# class with his Super MTA-Diesel; Laura won the 8500# class on Speedy's 560; Speedy, in addition to the win with the F-30, won the 4000# class with a 230 and the 9500# with the 560; and Troy won the 10500# class with his 560. The John Deeres and Olivers had a pretty strong day on Saturday.
! Pictures from Sunny Plain ! 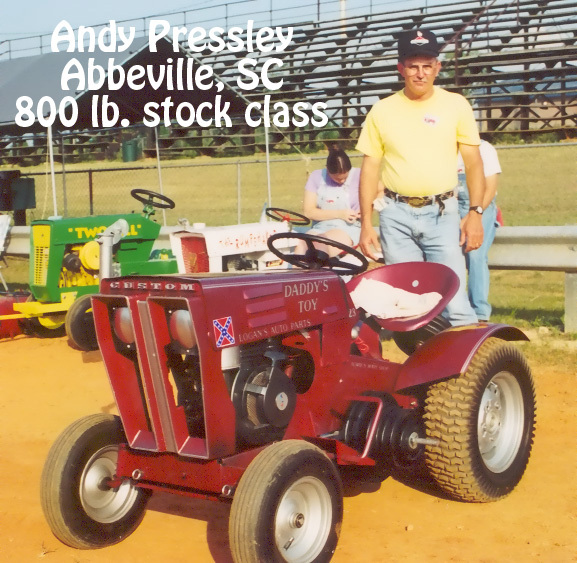 The Sunny Plain Antique Power Association was formed in the summer of 2001 by Otis Culclasure and his son, Rowdy. 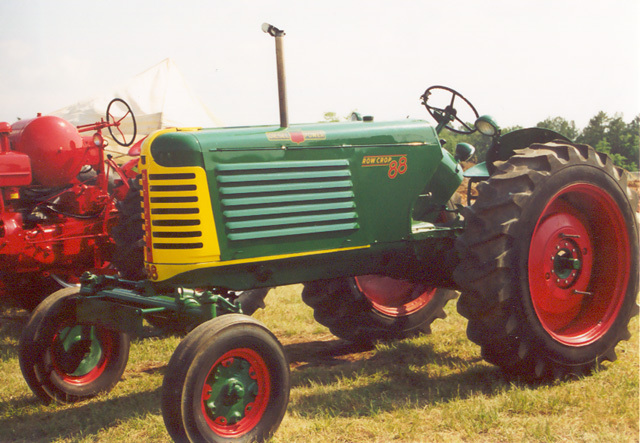 They attended an antique pull the previous March and developed "tractor fever". 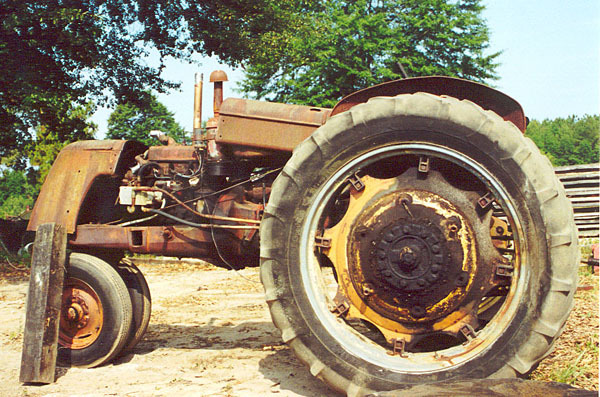 After forming SPAPA, the group of 50+ members decided to host the three day Old South Antique Farm Festival over Veterans Day Weekend 2001 on some property belonging to Otis. 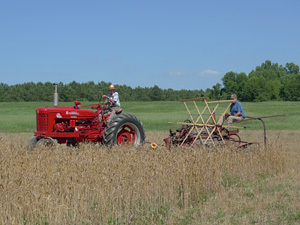 In addition to 3 days of pulls, there were several bands, kids pedal tractor pulls, a slow tractor race, judging of antique cars, trucks & tractors, parades of power, wagon rides, petting zoo, Sunday church services, and numerous vendors of food and collectibles. There's nothing like getting it right the first time out the gate! The weekend was a great success, leaving everyone asking "When's the next SPAPA event?" (Spring 2002). 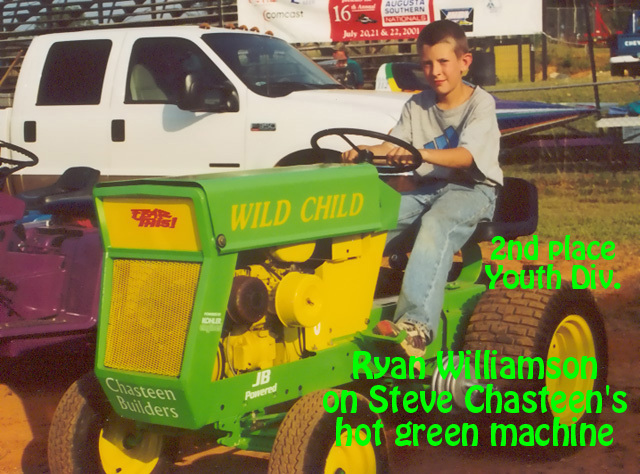 The Young Farmers were expecting a big truck turnout that night, and agreed to hold the antique tractor pull separately, earlier that day. 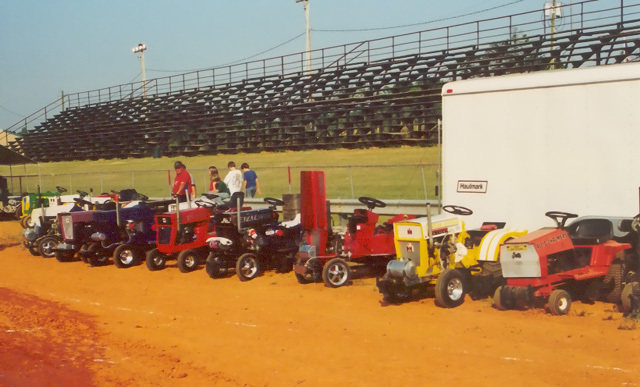 They'd originally planned to combine the tractors and trucks that night, limiting the number of tractor classes to save time, so we are glad they separated the two. 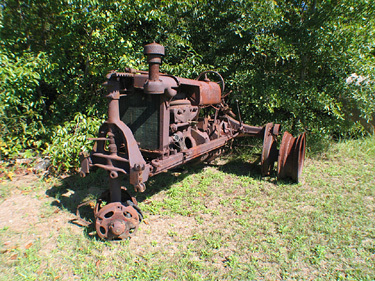 This was a fun pull (some trophies), for any weight antique tractor, and was a great opportunity to get ready for the upcoming fall pull season. The Young Farmers tried out their big new sled, "Gene's Dream." 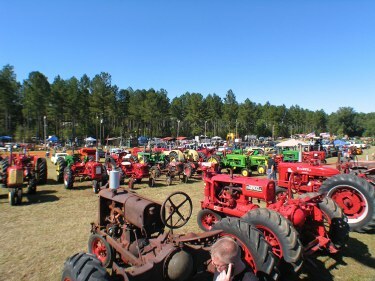 The tractor turnout was light, maybe due to the rainy weather. Heavy thunderstorms interrupted the pull for a few hours, but the guys worked hard to rework the track, and the pull was completed that evening. Here're a few shots of our soggy but happy crew. (Click on any image to enlarge). 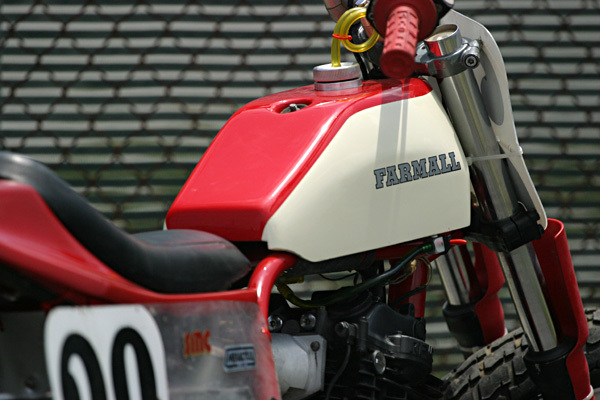 Yes, we have friends who drive those two-cylinder machines!